Today dear internet friends is a special day. A day when food lovers and fall fanatics come together and rejoice. Today is the virtual pumpkin party. Come on in, make yourself comfortable. Grab a cookie and a seasonal beverage. If you’re like, “what the hell is a virtual pumpkin party?” well, I’ll explain below. But just know you’re in the right place at the right time. 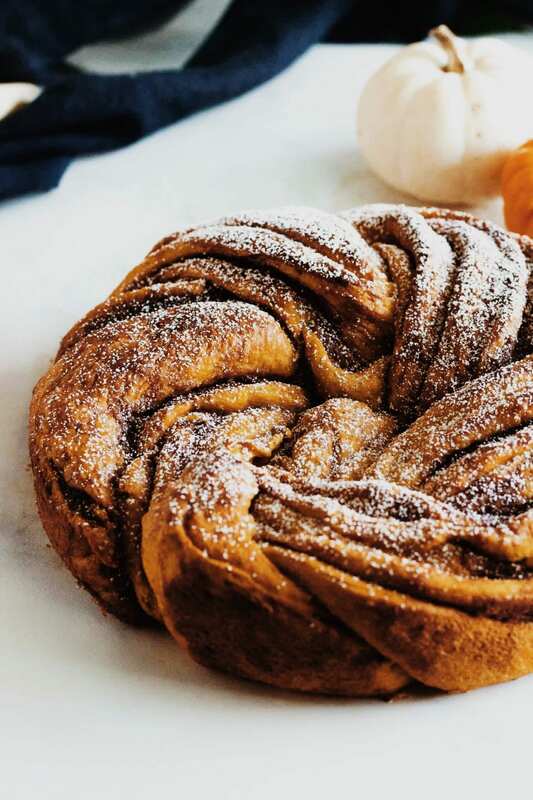 Kind of like this pumpkin brown sugar babka that has me swooning like my 10 year old self at an N*SYNC concert. 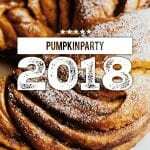 So what is the virtual pumpkin party? 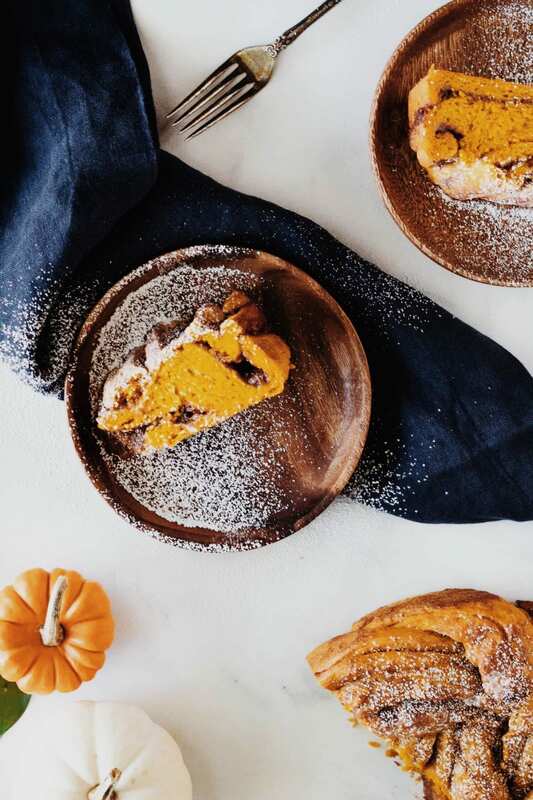 What’s a pumpkin babka? It looks like a cinnamon roll but it sounds like a hat. Good question. 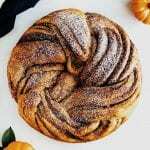 This, beautiful readers, is a pumpkin brown sugar babka. Now typically babkas are baked in a loaf pan, and sliced like bread, so I am taking some liberties here. But the general idea is the same. 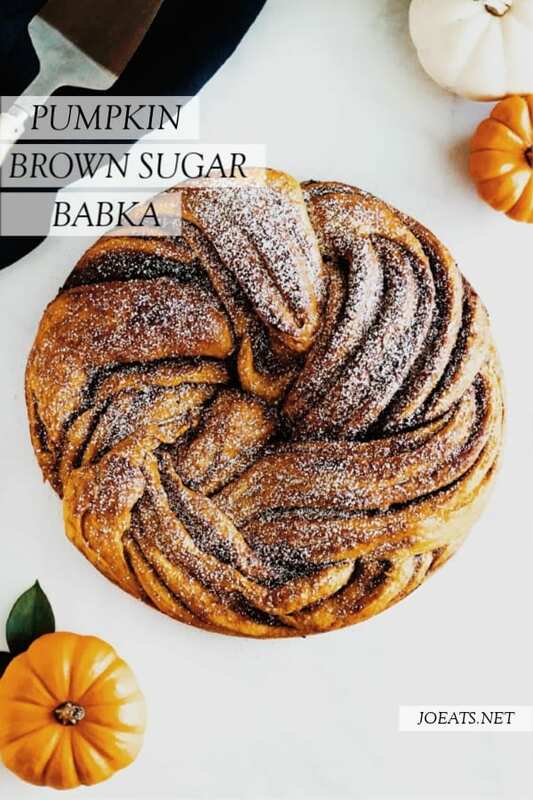 This pumpkin brown sugar babka, like any other, starts with an enriched, yeasted dough. This one is also packed with pumpkin and pumpkin related spices (think cinnamon, nutmeg, ginger, and cloves). The dough is then rolled out and generously covered melted butter and topped with a pumpkin-filled brown sugar filling. Then the whole thing is rolled up like you would if you were making cinnamon rolls. And that’s where things get a little crazy. Crazy? Like snake juice crazy? Well not quite, but it does get twisty like a snake. So you have your log of rolled up dough, which on any other day you might slice into individual cinnamon rolls (which is also totally fine and delicious btw). 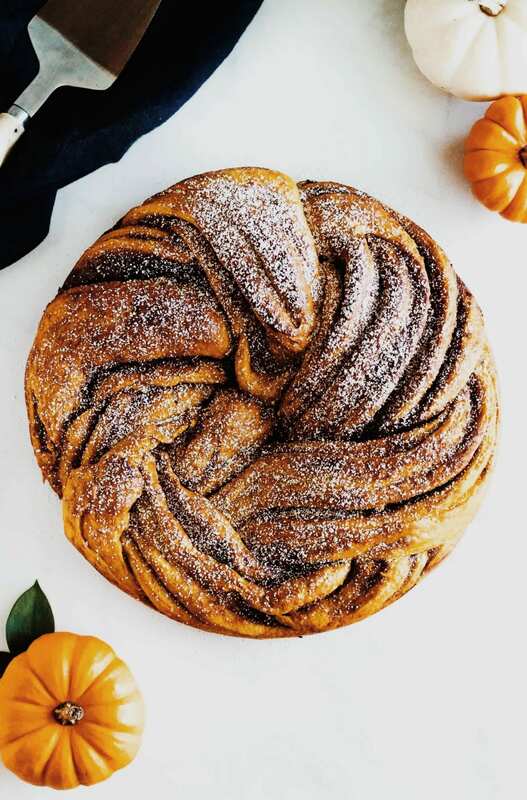 But instead of horizontally, you’re actually going to cut vertically, right down the center of the roll, so you’ll be left with two long pieces with their brown sugar, pumpkin babka swirly centers exposed (quite risqué, I know). You’ll gently lift one over the other and repeat to create a very simple, two-strand braid. Then bring the ends together and pinch the dough to form a ring. And just that like – babka! So why not just make cinnamon rolls? Because just look at it! It’s a thing of beauty. Something you’d proudly show off to friends coming for brunch. 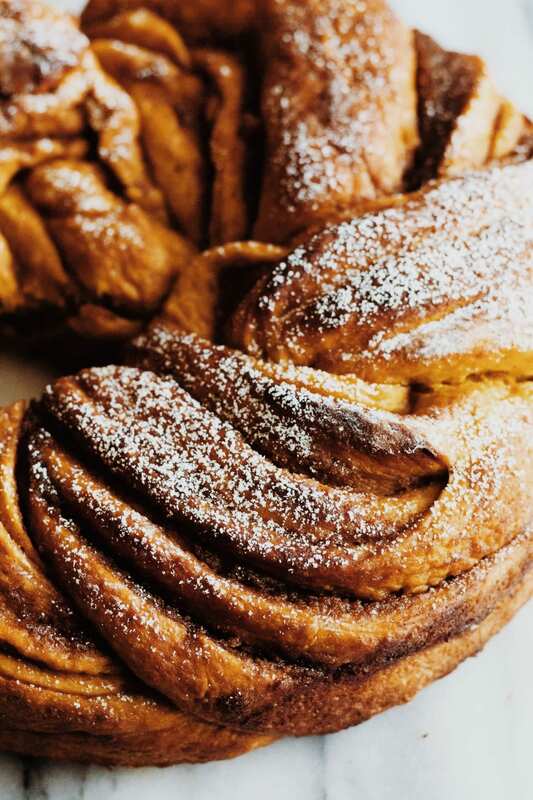 Although true story, I was trying to multi-task insanely hard a few weekends ago and burned the hell out of one of these – totally my fault, not the babka’s. But maybe in the future do not try to shower, mop the floor, bake a babka, fry bacon, and scoop the cat box all in the same moment. But when you do not burn said babka, everyone will ooh and ahh over how gorgeous it is and think how special they must be for you to have made something so awesome for them. And that’s a pretty great pay off in my mind. So with that I leave you with 50 plus pumpkin-filled recipes to gaze at longingly for the next few hours. Enjoy and happy baking! Oh and if pumpkin isn’t your thang, but you’re still in the mood for all things fall – feel free to check out this or that – because pumpkin shouldn’t have all the fun. Make this for your next brunch and wait for the oohs and aahs. The cream cheese icing is technically optional, but I really think it’s the cherry on top of something pretty special. If you get scared of the cutting and twisting process, don’t be. It’s a little messy, but totally doable. Happy baking! Heat the milk and butter in the microwave until butter is melted and mixture is warm to the touch, but not hot. This took me about 45 seconds. Stir the yeast and sugar into the milk and butter mixture and set aside for 5 minutes. In a small bowl stir together the cinnamon, ginger, nutmeg and cloves. Set aside. Add flour, salt and half of your spice mixture to the bowl of a stand mixer, and mix with a fork or your hand to combine. 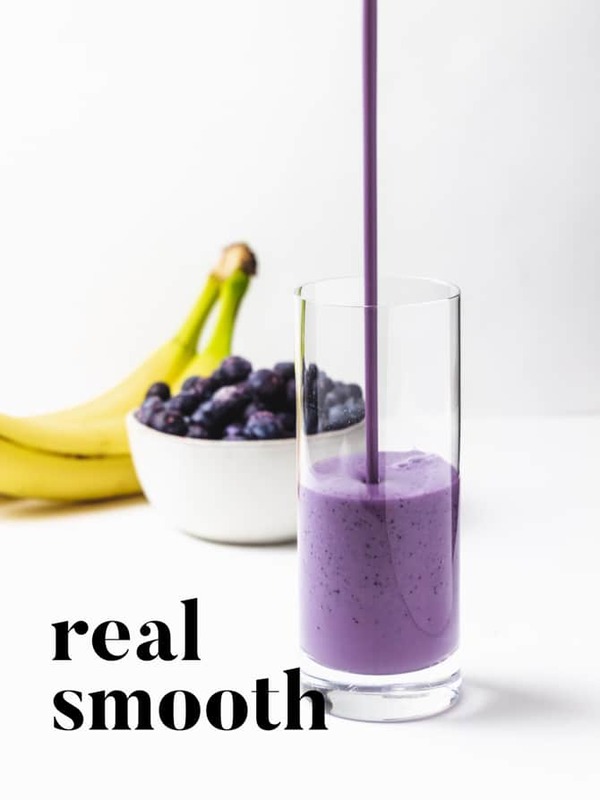 Take a look at your yeast mixture – it should be frothy and starting to bubble. Add it to the dry ingredients along with the egg yolk, pumpkin puree, and vanilla. Using a dough hook attachment, mix for 7-8 minutes. The dough should pull away from the edges of the bowl and stick to the bottom. It will still be sticky to the touch, but shouldn’t be an enormous mess – if it is add some of the remaining flour. I found that I needed about ¼ C extra flour before all was said and done. Place the dough in a greased bowl and cover with plastic wrap. Let it rise in a warm spot for about an hour, or until it has doubled in size. After the hour, transfer the dough to a well-floured surface and roll into a rectangle 12 by 18 inches. In a small bowl mix together the softened butter, salt, dark brown sugar, pumpkin puree, and the remaining spice mixture. Spread this mixture all over the dough in an even layer, leaving a ½ inch space on one of the long sides. Starting at the long end without the ½ inch space, roll the dough into a tight log. I find this is easiest by working in small increments from left to right and then back the other direction. When you’ve reached the end pull the remaining dough up and over the top of your roll and pinch to seal all the way across to form a seam. Trim the ends and slice the whole roll down the middle, vertically. Move the two pieces so that the filling is exposed and facing up. Then carefully move one piece under and over the other and repeat until you have a braided twist. Bring the ends of the braid to meet and pinch together to form a ring. Transfer the babka ring to a 9 inch cake pan (I used a spring-form), cover with plastic wrap and let rise for 45 minutes. While the babka ring rises, preheats your oven to 375° F.
Remove the plastic wrap and bake your babka for 45-55 minutes, or until it reaches an internal temperature of 195° F. If you bake yours in a spring-form pan like I did, make sure to place it on top of a rimmed baking sheet, in case it leaks – lest you want to spend an eternity scrubbing the floor of your oven. Let the babka cool in the pan for 15 minutes. Then remove from the pan and finish cooling on a rack. If you’re making the cream cheese icing (which I highly recommend) whisk together all the ingredients in a small bowl and get ready to drizzle. Drizzle with icing, or if not using dust with powdered sugar, slice and serve. If you want to make this the night before, follow the recipe until it’s time for the second rise (after shaping it into a ring) and cover the whole thing with plastic wrap and pop it in the fridge. In the morning, let it sit at room temperature for two hours and then bake as directed. 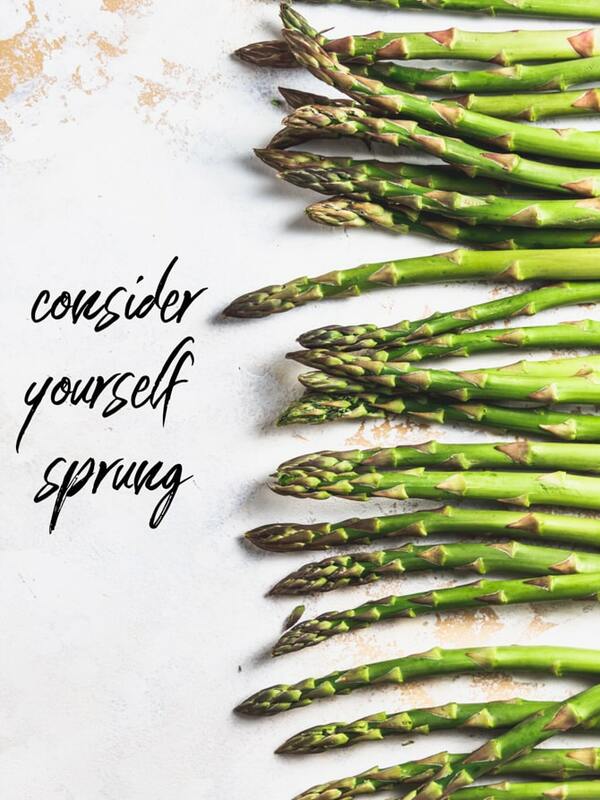 Sign up to get recipes, tips, and other super secret stuff sent straight to your inbox! 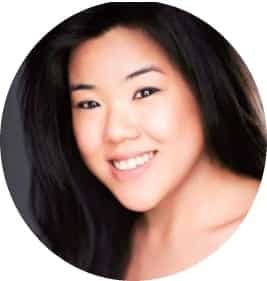 I'm a self-taught, home cook who loves pretty much all things food. 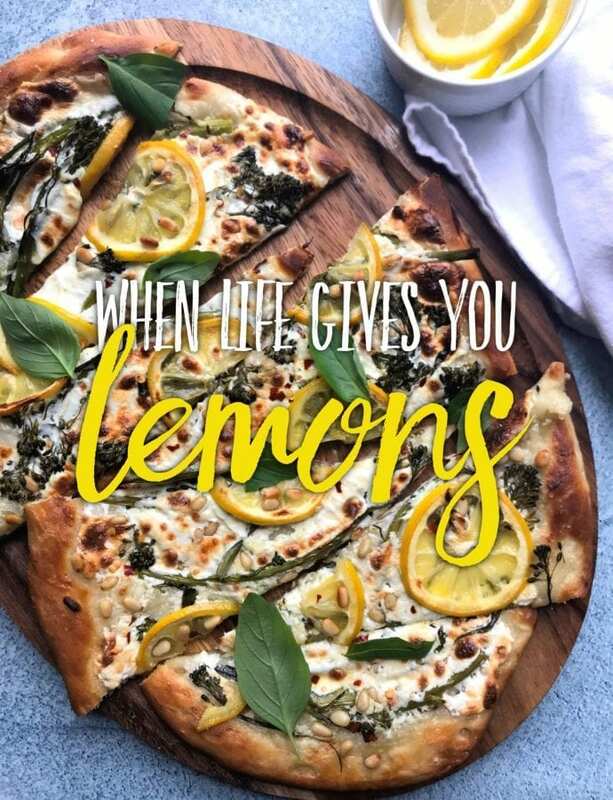 I am obsessed with creating, photographing, and sharing beautiful and accessible recipes with YOU. Thanks for stopping by!